Navajo's have always been, and will always a matrilineal society. We represent our mothers first clans. The very first Navajo leader was Asdzáá Naadleehi, Changing Woman, who created us. She led our people in a life full of prosperity with songs and prayers. It's our mothers who pray more for her kids than herself. She cooks the meal but has the last bite. Even in our traditional ceremonies, our songs are based among female deities. Shimá Nahasdzáán, Dził Asdzáá, Tó Asdzáá, Ch'il Naad'ąąh Asdzáá, and much more. It's the women who hold and carry the family tradition and values. Once it was announced that Changing Woman reached puberty and experienced her first woman menstrual, the Holy People came together, each bringing a white shell they held precious. They dressed her up in a white buckskin, adding the shells onto her dress. She stood there, glowing in such beauty and they gave her the name Yoołgai Asdzáá, White Shell Woman. Her hair was brushed and tied into a ponytail at the nape of her neck with a strip of buckskin that was cut from a deer called Doo K’aak’ehii, unharmed buckskin. 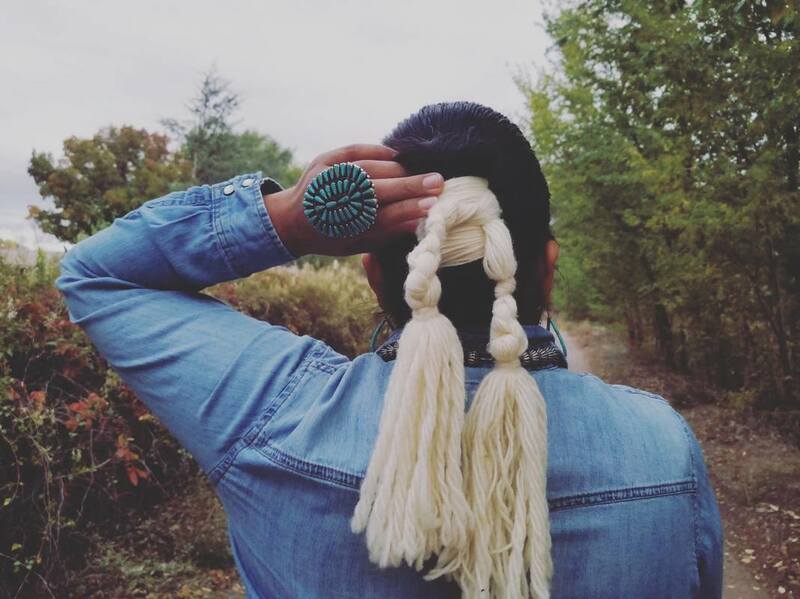 The gathering and tying of Changing Woman’s hair with the buckskin signified the importance of gathering one’s own thoughts, focus, determination and life goal accomplishments. Changing Woman represents transformation and a rebalancing of the male and female energies in the universe. We chose her name and likeness for our organization, because we look to be a force to rebalance, create harmony, and space for ceremony in all the transformations women experience in their lifetimes.